Partner with us and become part of the solution. We have watched with horror for the past four years as sites built by our ancestors across the Middle East, some over 6,000 years old, have been needlessly looted and destroyed as a sign of intolerance of different beliefs. In a time of crisis, some argue a choice must be made between saving lives and saving culture. But that is a false choice. Heritage is an essential element of who we are – as a people and as individuals; who are we without music, a common history, traditions, our literature as well as our relics, religious, and archaeological sites that unite us. As groups like ISIL cross Iraq and Syria, these terrorists realize that attacking heritage is a means to break the spirit of a population. Irina Bokova, director-general of UNESCO, has eloquently noted that to counter religious extremism, acceptance of our diverse past, our culture, must be a part of any effective peacebuilding strategy. Those who believe in freedom of expression and religion should understand her message. It is not just the terrorists who are trafficking in these illicit antiquities. Organized criminal gangs are profiting from wide-scale and systematic looting – or cultural racketeering. The FBI notes that this global crime benefits criminals in the billions of dollars every year. These operatives run global networks from Bulgaria to Shanghai, from Bogota to Jerusalem, and Istanbul to Tokyo. The United States is one of the top destinations in the world for these “blood” antiquities. They are in the auction houses, in private collections and on the Internet. The Antiquities Coalition is a non-partisan not-for-profit that brings together a diverse group of dedicated experts who have joined together to battle against this crime. 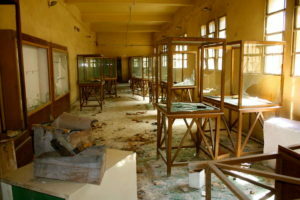 I have witnessed first-hand the looting of well-known sites in Egypt. 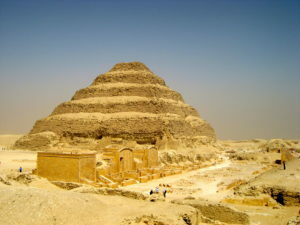 After the Revolution of 2011, the security system broke down, which led to mass looting in the country that is home to some of the most well-known stories of history: the pyramids, the Child King Tut, and Cleopatra’s ill-fated love, all of which are intrinsic parts of the collective human narrative. Satellite imagery showed previously pristine sands pockmarked with looter pits as the thieves scavenged for treasure. The ground was littered with mummy wrappings, broken pottery, and pieces of wood from sarcophagi under our feet as we walked the sites; symbols that the criminals have found intact tombs. These valuable antiquities, ripped from their resting ground, are showing up in leading world markets for sale. And demanding prices up into the millions for some. But the money does not go back to the local people, who might be justified in looting to support their family. Instead, 95% of the profits go to the middleman or the criminal networks. Working across the sectors of policy, economics, academia, and business, we have developed innovative solutions to combat cultural racketeering. It is a global problem that requires a global solution. And we want it to stop now! Our Chairman, Deborah Lehr, was the recipient of the 2017 Hadrian Award. Watch her interview on the Antiquities Coalition.